Marshal Józef Piłsudski Legia Warsaw Municipal Stadium (Polish: Stadion Miejski Legii Warszawa im. Marszałka Józefa Piłsudskiego), traditionally also referred to as the Polish Army Stadium (Polish: Stadion Wojska Polskiego, pronounced [ˌstadjɔn ˌvɔjska pɔlˈskʲɛɡɔ]) in Warsaw, Poland, is an all-seater, highest fourth category football-specific stadium. The venue is located on Łazienkowska street in Śródmieście district. It is the home ground of Legia Warsaw football club, who have been playing there since August 9, 1930. The stadium underwent a two-stage, complete reconstruction in the years 2008-2011. Only a small part of the main building facade was preserved from the old construction (with another part being precisely reconstructed). With space for 31,103 spectators it is the 5th biggest football stadium in Ekstraklasa and the 7th biggest in the country. The stadium is equipped with a heated pitch, training pitch, underground parking, sport bar, club museum and other facilities. The stadium, which for decades belonged to the Polish Army, is currently owned by the City of Warsaw. The necessity to build a new stadium for Legia Warszawa players increased in the mid-1990s, when Legia had one of the most successful periods in its history. Polish championship (Ekstraklasa) (1993 - withdrawn, 1994, 1995), Polish Cup (1995, 1997), semi-final of the UEFA Cup Winners' Cup (1991) and the quarter-final of the UEFA Champions League (1996) strengthened the demand to modernize or even replace the old facility. Ultimately, however, until 1997 virtually nothing on this subject has been done. The complicated legal status of the land, which belonged to the military, effectively discouraged potential investors. The new hope came together with the new owners - Daewoo company, which bought the majority stake in Legia in the late 1996. The Korean club owners strongly lobbied the City of Warsaw to take over the property and invests in the new facility, however, the then owners of the site - the Military Property Agency - was not willing to sell the property. The deadlock existed for the next 5 years, during which time the Koreans sold the club. Eventually, the sale went through on July 29, 2002, when the City of Warsaw acquired the title to the land. Although the market value was estimated at 60 million PLN, the purchase price was agreed at 16 million PLN. In October 2004, Warsaw's chief architect Michał Borowski gave permission to build a new stadium on the said land. The decision led to the announcement of tender for redevelopment of the Legia's facilities. On September 25, 2006 the City of Warsaw dismissed the offer of the German consortium: HMB Stadien GmbH und Sportstättenbau with Wayss Schlüsselfertigbau und Freytag AG and Krupp Stahlbau Hannover GmbH, which had won the tender. Their project planned the construction of a building with a capacity of 30,500 to 35,000 spectators, with underground parking, and - a first at a Polish sports facility - was supposed to have a fully retractable roof. The City, however, did not accept the consortium's condition that all the funds for the construction be secured by the investor prior to the construction. The Polish side cancelled the deal. On September 26, 2006 Legia's new owners - ITI Group - during a meeting with the acting President of Warsaw Kazimierz Marcinkiewicz, in the club premises presented their own idea of rebuilding the stadium. Their idea provided for the construction of the stadium in stages (so that the club could still play games during the construction), with the capacity between 31,800 and 34,000 seats (depending whether standing spaces were included). In November of that year, the club signed a 23-year lease with the City of Warsaw. In June 2007, the Warsaw City Council allocated 360 million PLN in funding (which later had to be increased to 460 million PLN) for the construction of the new stadium according to the club's proposed design. In April 2008 the then President of Warsaw Hanna Gronkiewicz-Waltz issued a permit for the construction of the stadium. On November 12, 2008 the investor - the City of Warsaw - signed an agreement with a consortium Polimex-Mostostal for the construction works. On November 17, 2008 the first stage of the new stadium construction began. This stage provided for the demolition and construction of three stands: the southern, the eastern, and the northern one. Works began by the demolition of the club's old premises and of the eastern stand (the famous "Żyleta"). The first stage was completed and taken over by the investor on May 10, 2010. The stadium was officially opened (with only three stands completed) by a match against Arsenal F.C. on August 7, 2010. The second stage of construction, which provided for the demolition and construction of the eastern stand (the main stand - so called "Kryta") was completed and taken over by the investor on May 10, 2011. Pepsi Arena at Łazienkowska Street is located in Warsaw, in the Śródmieście district, Powiśle area, within the square of the streets: Łazienkowska, Czerniakowska, Kusocińskiego and Myśliwiecka. It was officially opened on August 9, 1930, and since then it has been significantly modernized and reconstructed. The most recent reconstruction, November 2008 to March 2011, involved the demolition of all the stands and the construction of brand new ones, with only the historic façade of the main "Kryta" grandstand preserved. 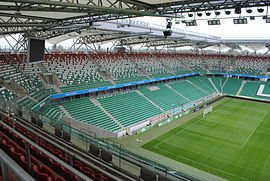 The stadium is commonly referred to as the "Nowy Stadion (New Stadium)" in its current form. The new stadium, designed by the German studio JSK Architekten, meets the criteria for the UEFA Elite class, which allows it to host semi-finals of the Champions League. The facility is five-storeys high and is fully roofed with its maximum height not allowed to be higher than nearby Ujazdów Castle. The stadium includes press boxes, office spaces, as well as a fitness and wellbeing center for players and coaching staff. There are also 12 catering stands, a sports bar, Legia club museum and two club merchandise stores located within the stadium. The stadium's capacity is variable. The general capacity is 31,103 all seating spaces, however it is possible to increase the capacity up to 33,609, by way of creating 6,126 standing spaces (leaving 27,483 seats). These figures include press posts and VIP seats in the total amount of 2,137. The number of press posts can be increased at the cost of seats for regular spectators. The location of the stands compared to the old stadium has not been changed. Only the playing field has been slightly moved in a south-eastern direction. The stadium has four two-level stands. These are: the western stand (the main stand, commonly referred to as "Kryta"), the eastern stand (named after Kazimierz Deyna), the northern stand (commonly referred to as "Żyleta") and the southern stand (unofficially named after Lucjan Brychczy). Within the first level of the southern, eastern and northern stands located are the parking lots. The seats in the stadium are made from polypropylene. They are resistant to weather conditions and mechanical damage. A similar model is already used in Allianz Arena. The stadium has three categories of seats: the regular seats, press seats and VIP seats. Press seats have additional desktop space, power sockets and Internet access. Seat colours on the stadium is associated with the club's colours. The lower level of the stands is green, while the upper is a mix of three colors: green, white and red. There is a white inscription "LEGIA" on the east grandstand. The railings of the stadium are made of glass, which allows to comfortably watch the sport events. The railings are 130 cm high and 2 cm thick. They consist of double-layer glass shields, which may resist up to 200 kg per square meter. The stadium has two video screens. They are attached to the steel elements of the roof structure in the north-west and south-east corners of the stadium. The screens are 5.4 m wide and 9.4 m high. Each of them weighs 7 tones. The entrance gates are equipped with SKIDATA Vario Gate reader. The stadium is one of the few arenas in the world to use this type of readers. The biggest advantage of this device is the ability to control various types of tickets (e.g. the traditional paper cards, magnetic cards, as well as MMS tickets in mobile phones.) The reader has a color screen, which may display messages to fans entering the venue. The same equipment is being installed in the parking lot, allowing the fans to move around the stadium with only one card. The club also plans to introduce a non-cash payment system, which will accelerate the speed of making various purchases around the stadium. The stadium's lighting system is divided into several separate sections: lighting of the space under the grandstands, promenade illumination, spectator's stand lighting, and finally illumination of the pitch itself. The illumination of the pitch is 2000 lux (power 516 kW), which enables the transmission of matches in the HD technology. The illumination system located in front of the stadium’s promenade allows for effective and multi-colored lighting of the outer parts of the stands and the roof structure. The stadium has four entrances, two on Łazienkowska Street and two on Kanał Piaseczyński. They lead to the promenade, from which the fans may access the stands. The promenade is located approximately 6 meters above street level. The promenade includes catering facilities and toilets. It is the main route between different sections of a particular stand. Fans may not access other stands through the promenade. The Legia club museum is located within the north stand. It was established with the cooperation of Legia supporters, in particular with its current custodian - Wiktor Bołba. The concept of the museum is to guide visitors through all the periods of club's history. The museum hosts temporary exhibitions commemorating important events in the club's history. It was opened on October 23, 2010 - the 63rd anniversary of Kazimierz Deyna's birth. The Sports Bar & Restaurant "Łazienkowska 3" is located within the north stand (under the famous "Żyleta"). The facility is open not only during the games but also during the week. Inside the restaurant, there are TV screens, where sports events are broadcast. It was opened on August 7, 2010 before the inaugural match against Arsenal F.C.. The TV studio is located in the south-west corner of the stadium, on the second level of the stands. It is suitable for hosting various kinds of presentations and conferences. Within the studio, the stadiums operational centre is located, where the sound system, lighting and monitoring systems are managed. Inside the stadium there is a two-level car park. It is located at the back of the southern, eastern, and northern stands. The first level accommodates 387 vehicles, the second level 392. Moreover, in front of the main grandstand there are spaces for 18 cars (a VIP section). In total, the stadium offers 797 parking spaces. The entrance to the car park is located in the north-east corner of the stadium, and a separate entrance dedicated to team buses is in the north-west corner. Between 2011 and early 2015 the stadium was officially known as Pepsi Arena on the basis of a sponsorship agreement with PepsiCo. Currently the stadium naming rights are not commercially exploited. Żyleta (Polish pronunciation: [ʐɨˈlɛta], English: the Razor) is a common name for the northern stand in the Polish Army Stadium in Warsaw, Poland, traditionally occupied by the most spontaneous and fanatical fans of the Legia Warsaw football club. Before the stadium's renovation (2008–2011), the “old” Żyleta referred only to the central section of the eastern stand of the stadium (occasionally, it would also refer to eastern stand as a whole). There is a special exhibition dedicated to the "old" Żyleta in the Legia club museum. Today, after the stadium renovation, the “new” Żyleta means the whole northern stand of stadium (located behind the goal). Capacity of the stand is 7,477 spectators. Kazimierz Deyna monument is a statue dedicated to one of the most famous Legia players in the club history. The monument is located just in front of the entrance to the Żyleta stand in the north-east corner of the stadium. An official committee was founded by fans and people related to the club to finalize the project named Let’s built a monument for Deyna. There was a competition launched to design Deyna’s monument. The winner was a project designed by Tomasz Radziewicz. The design was selected via an Internet poll, and many different actions have been undertaken by fans to raise money for this monument. The 3.2 m tall statue was cast from bronze and it is situated on a small illuminated socle. The official unveiling ceremony took place on June 6, 2012. Kazimierz Deyna is one of Poland's most decorated footballers, having won 97 caps and scored 41 goals for the white and reds (the national team). A gold medal winner at the 1972 Munich Olympics (and top scorer with nine goals), he was also part of the third-placed Polish team at the 1974 World Cup in West Germany, before winning the silver medal with the national side at the 1976 Summer Olympics. It was in 1974 that he was ranked third in the European Footballer of the Year list, behind Dutch great Johan Cruyff and West Germany captain Franz Beckenbauer. He died in a car accident in San Diego, California, aged just 41 in September 1989. In the past, the old Legia Stadium was used many times as a venue for the Poland National Football Team, especially during the Thirties and Nineties. Since the reconstruction, the national team has played four matches at the stadium. All of them were friendlies. ^ "T-Mobile Ekstraklasa: Legia 5-0 Śląsk". 90minut.pl. Retrieved 2013-06-02. ^ "Stadion Wojska Polskiego - Warszawa". arenysportowe.eu. Retrieved 2013-04-21. ^ "Stadion Wojska Polskiego im. Marszałka Józefa Piłsudskiego (Pepsi Arena)". stadiony.net. Retrieved 2013-04-21. ^ "Stadium info". stadionlegii.pl. Archived from the original on 2012-03-31. Retrieved 2013-04-21. ^ "Historia stadionu Legii". stadionlegii.pl. Archived from the original on 2012-03-31. Retrieved 2013-04-21. ^ "Rada Warszawy zatwierdziła zwiększenie budżetu na stadion Legii". gazeta.pl. Archived from the original on 2012-10-03. Retrieved 2013-04-21. ^ "Wiceprezydent Warszawy: Stadion Legii droższy o prawie 100 milionów Legii". gazeta.pl. Retrieved 2013-04-21. ^ "Zakończone odbiory stadionu Legii. Mogą wpuścić 31 tys. kibicow". legionisci.pl. Retrieved 2013-04-21. ^ "Polish Army Stadium Tour Review". tikitouringkiwi.com. Retrieved 2017-09-01. ^ "Stadion - Projekt". legia.com. Retrieved 2013-03-14. ^ "Stadion Wojska Polskiego im. Marszałka Józefa Piłsudskiego (Pepsi Arena)". stadiony.net. Retrieved 2013-03-14. ^ "Marek Drabczyk: Nasza współpraca układa się bardzo dobrze". legia.com. Retrieved 2013-03-14. ^ "Wybrano model krzesełek". legia.com. Retrieved 2013-03-14. ^ "Nowe szyby na Legii". warszawa.gazeta.pl. Retrieved 2013-03-14. ^ "Siedem kondygnacji i dwa telebimy, czyli nowy stadion Legii". qmichal. legionisci.com. Retrieved 2013-04-21. ^ "Legia jak Allianz Arena czy Old Trafford". legia.com. Retrieved 2013-04-21. ^ "Warszawa: Wielka iluminacja". stadiony.net. Retrieved 2013-04-21. ^ "Stadion Legii - warszawska realizacja pracowni JSK Architekci". Architeon.pl. Retrieved 2013-03-14. ^ "Muzeum Legii Warszawa". legiawarszawa.manifo.com. Retrieved 2013-04-21. ^ "Pepsi Arena, czyli nowa nazwa stadionu Legii już obowiązuje". ekstraklasa.net. Retrieved 2013-04-21. ^ "Legia Warsaw official website: Muzeum Legii - Żyleta". Legia.com. Retrieved 2013-04-21. ^ "Pomnik Deyny". pomnikdeyny.pl. Retrieved 2013-04-21. ^ "Warsaw remembers Poland legend Deyna". uefa.com. Retrieved 2013-04-21. Wikimedia Commons has media related to Pepsi Arena. This page was last edited on 17 February 2019, at 13:59 (UTC).